DOUBLE QUAD Hybrid double quad antenna (Biquad antennas) . Directional quad antennas for 2m & 70cm. Directional antenna for mobile (portable) and base station use. YAGI ANTENNA Yagi antennas (beam) of BAZ, are special directional antennas for the 2m and 70m-Band as short Yagi antenna and long Yagi antenna, stabilisation with cross beam - ideal for DX and Contest. 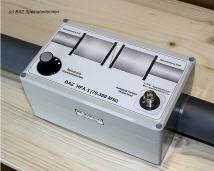 The quad antenna is an antenna which is frequently used by amateur radio operators. It consists of a driven element and parasitic elements, like a Yagi; however, the elements are square loops. The bandwidth for a 3-element Quad antenna that is tuned for maximum gain is limited because excursions from the design frequency unbalance the near resonance condition of the parasitic elements. However, by lengthening the reflector and director elements, thus sacrificing approximately 1 dB gain, the entire 10 meter band may be worked with an SWR below 1.75:1.